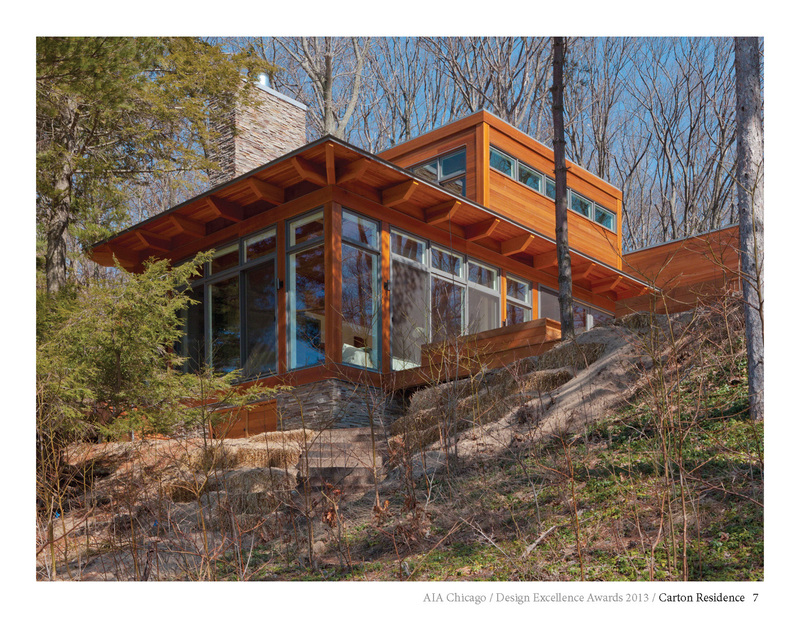 Completed in spring 2011, the Carton Residence was built as a lake home on an intimate site along Michigan's western coast. Mirroring the intimate scale provided by the surrounding tree-filled ravine, the structure was kept simple, efficient and elegant. Designed to be therapeutic and engage the senses, the home provides a place of escape and respite while encouraging physical engagement with the surrounding environment at a human scale. The volumes of the home are arranged to frame the horizon line of Lake Michigan to the west. The axis of the main house emphasizes this view, while perpendicular elements such as the entry bridge, natural-cedar stair hall, and indoor/outdoor dining area add a richness to the design. A series of framed views occur throughout the house capturing snapshots of the surrounding tress, lake, and ravine. The two volumes are set lightly atop a stone plinth and thus float gently over the bowl-shaped ravine. This works to minimize the impact of the footprint on the fragile dunes setting. Local materials such as blue stone and cedar wood ensure the house will weather naturally and have an indigenous feel, adding a warm atmosphere and a sustainable character to the design.